ZTE's sub-brand Nubia launched its latest flagship smartphone Nubia X on Tuesday. The most important feature of Nubia X is the dual display. The phone has 6.26 inches and 5.1-inch screens. 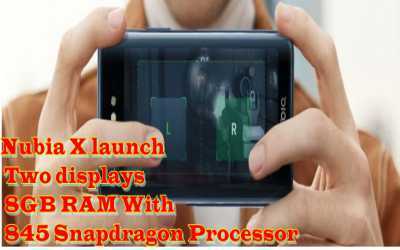 Other features of the smartphone include the Snapdragon 845 processor, two rear cameras and 8 GB of RAM. There is no front camera in it nor does the display NOTCH. With the help of user dual display, only the selfie will be able to take the rear camera in Nubia X. The smartphone has been made available in the company's domestic market. It is worth noting that the smartphone has been made available in four gradient colors. Nubia X's 6 GB RAM / 64 GB storage variant will be sold in the Chinese market for 3,299 Chinese Yuan (around Rs 35,000). This price will get black and gray color models with Gold. Blue model costs 3399 Chinese yuan (around Rs 36,000). The 8GB RAM / 128GB storage variant will be sold in 3,699 Chinese Yuan (around Rs 39,200). This price is of black and gray color model with gold color. The price of the blue model of this variant is 3,799 Chinese yuan (around 40,300 rupees). The premium 8 GB RAM / 256 GB storage variant is priced at 4,199 Chinese yuan (about Rs 44,500). There will be black and gold color variants at this price. The price of Blue and Gold models are 4,299 Chinese yuan (about 45,600 rupees). Dual SIM is Nubia UI 6.0.2 custom OS on Nubia X based on Android 8.1 ORIO. The smartphone has a 6.26-inch full-HD + (1080x2280 pixels) primary display. Its aspect ratio is 19: 9. Nubia X has Corning Gorilla Glass 3 protection. The secondary display of this phone is 5.1 inches. It is equipped with HD + (720x1520 pixels) display, 19: 9 aspect ratios and Corning Gorilla Glass 3. Nubia X has the Adreno 630 GPU with 64 bit Qualcomm Snapdragon 845 processor. RAM has two options, 6 GB RAM and 8 GB. The smartphone has a dual camera setup. The primary sensor of 16 megapixels has been given. It is equipped with F / 1.8 aperture, PDAF, dual-tone LED flash. Secondary sensor is 24 megapixels. Its aperture is F / 1.7. There is no front camera in it. But behind the display, you can use it to take selfies.